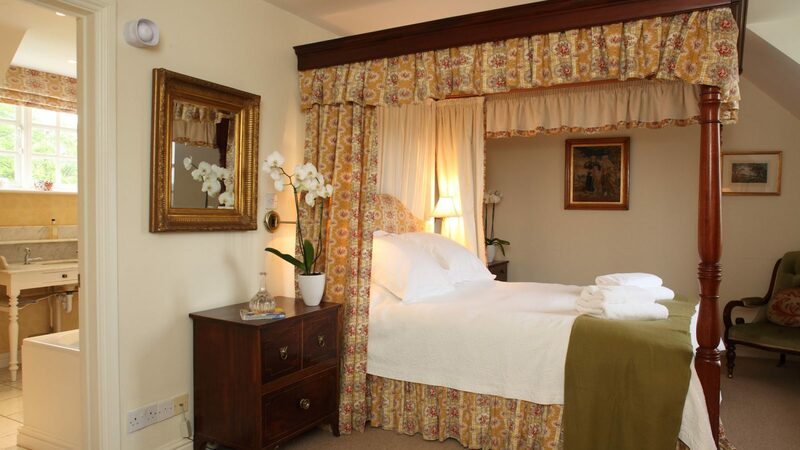 The luxury comes in the high ceilings, elegant furnishings and designer wallpaper. 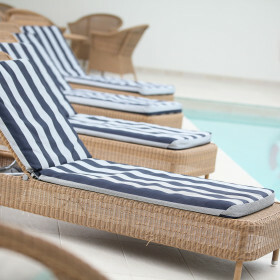 Playtime comes in the shape of the heated indoor pool, gym, play cabin, games room and spa treatments. All giftwrapped in honeyed Cotswold stone. 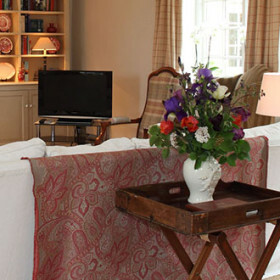 There’s an easy luxury to Newmarket House. You can lose yourself in the elegance of the high ceilings, the en-suite shower and bathrooms, the marble-topped washstands, the French fauteils and the cavernous spaces. Then there are the names. Sofa fabric is Colefax & Fowler. Curtains are Ian Mankin cotton. 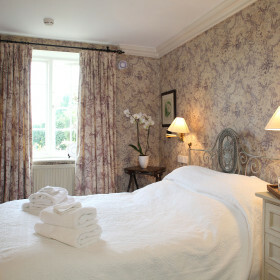 The downstairs bedroom comes papered in Nina Campbell chinoiserie. In the kitchen, the range is Britannia. 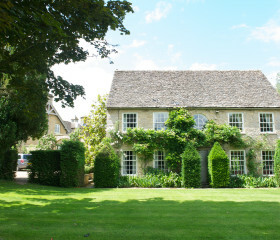 The house is set in a group of ultra-stylish cottages, amongst beautifully landscaped gardens with a croquet lawn, playground and tennis court, and a backdrop of Cotswolds hills. A grand setting then, for a party or a weekend escape. The open fire is made for a naughty nightcap. 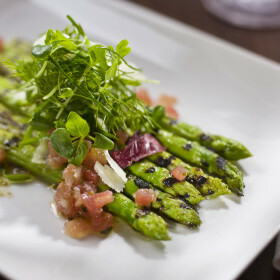 The terrace, flanked by lilies, vines and clematis and facing the walled garden, is crying out for an al-fresco salad and a Sauvignon Blanc backed by blue hills. 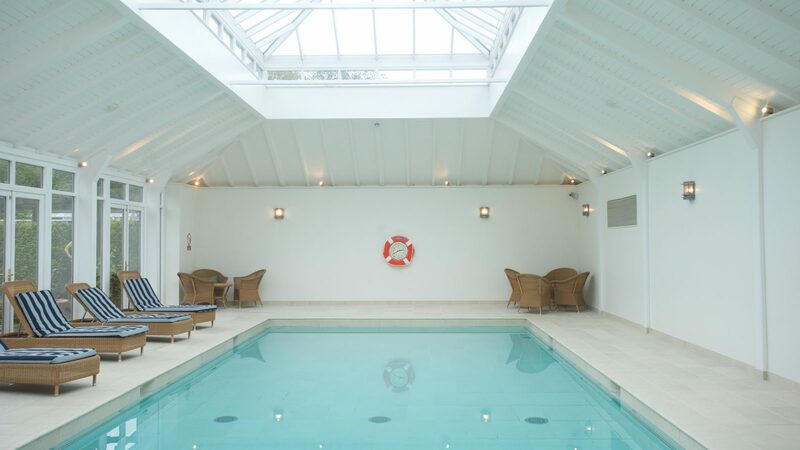 For playtime there’s indoor heated swimming, the gym, spa treatments and aromatherapy. A playground and play cabin for kids and a games room with pool table for the big kid who drove you there. 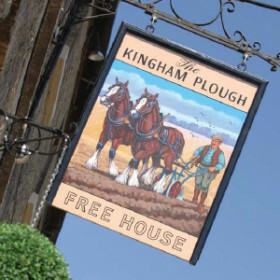 Drag yourself away and you can explore perfect Cotswolds villages, while the kids discover the wilder side of the Cotswolds, with days out to castles, farm parks and wildlife centres. 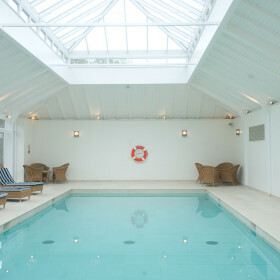 The light and bright pool house with a 12m heated pool and sun loungers is the perfect place to spend an afternoon, whether playing with the kids or just looking for some relaxation. The pool is shared. 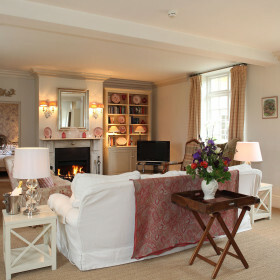 Relax at the spa on-site – all your pampering needs from massages to facials and manicures to pedicures can be fulfilled during your stay at Newmarket House. The spa has been featured on Tatler’s 101 Best Spas in the world. 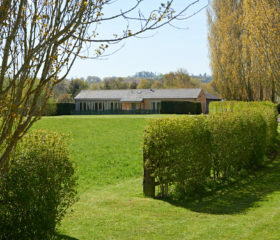 In the beautifully landscaped communal gardens and grounds, facilities include tennis courts, croquet pitch and swimming pool. 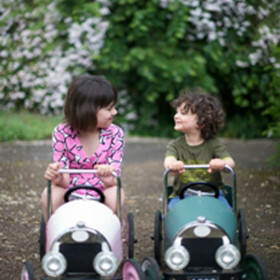 There is also a special play area for children with a mini-playground, two-storey Wendy house and a heated play cabin with dressing up gear, toys, art materials and fantastic retro pedal cars and tractors. Through the central arches at Newmarket House you enter into an enormous open-plan living space, complemented with large windows looking out on to the stunning gardens. 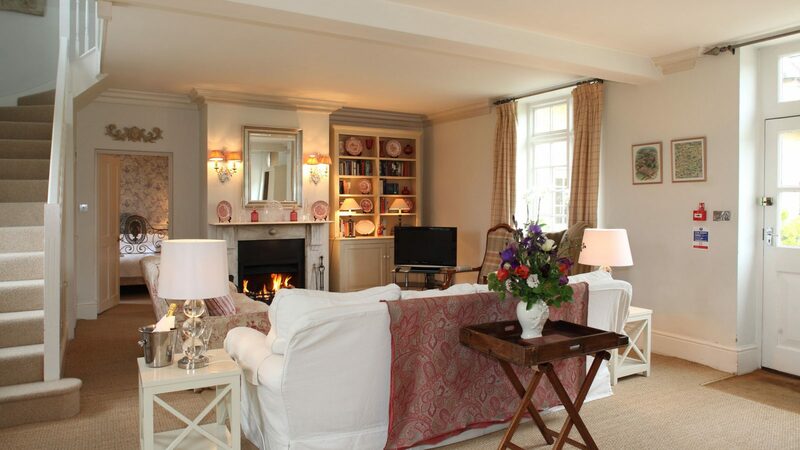 Newmarket House is decorated in an elegant Gustavian style, with pale grey walls, off-white rugs and off-white woodwork. 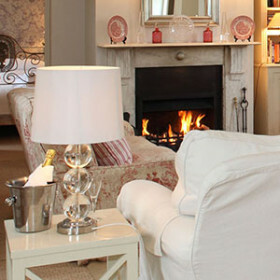 The greys and whites are delicately warmed by the pink Victorian cranberry glass surrounding the fireplace and a rose-and-white checked sofa, which fits so pristinely in the converted barn. 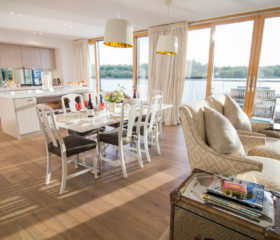 The dining room, lounge and kitchen all flow together, perfect for a party or a peaceful weekend. 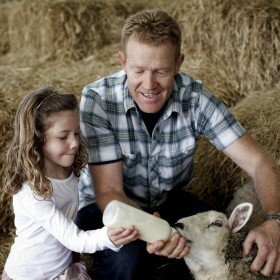 Just a quick drive up the road is Daylesford Organic, the fanciest farm shop in the land. There you can stock up on the best organic meat, vegetables, fruit and bread. 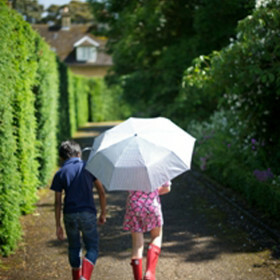 Check out the garden and clothes shops. And head upstairs for a coffee or a bite to eat. Of course, if you’d like to dine in that can be arranged too. Help yourselves to the well equipped kitchen. Or line up a top chef. 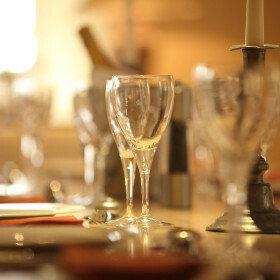 We offer everything from casseroles dropped off ready for the oven to waitress-served in-house catering. 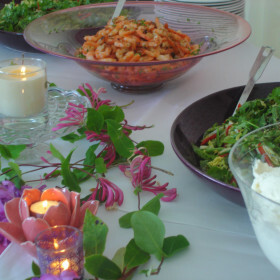 For special occasions, we can arrange all kinds of catering – from a simple buffet, to a summer BBQ or a fully catered holiday. Just let us know what you’re looking for and we’ll sort it out. 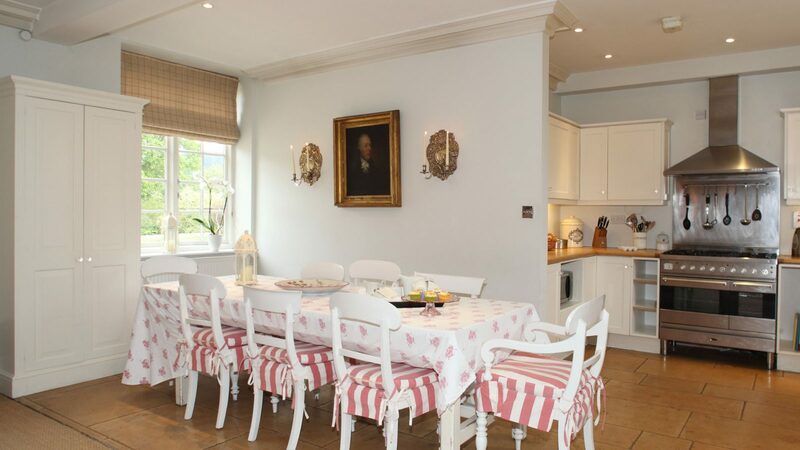 The kitchen at Newmarket House boasts all modern technology, including a large American style fridge freezer and stainless steel range cooker. 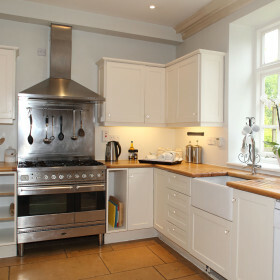 Beech wood surfaces throughout the kitchen give it a farmhouse feel. 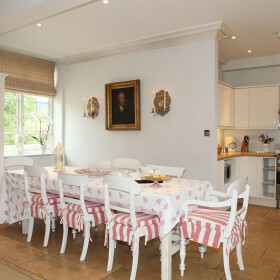 The traditional country dining table at Newmarket seats up to eight guests comfortably. 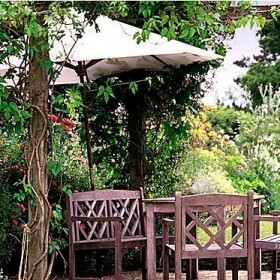 There’s also a private garden terrace, perfect for alfresco dining. 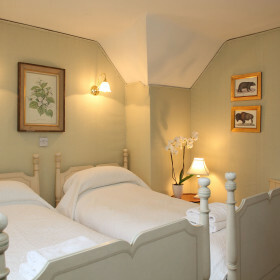 Newmarket House has four elegant bedrooms which can accommodate up to eight guests, with room for a cot where required. There are two double bedrooms and two twin bedrooms. 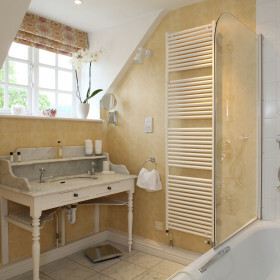 Each of the four bedrooms has an en suite bathroom. 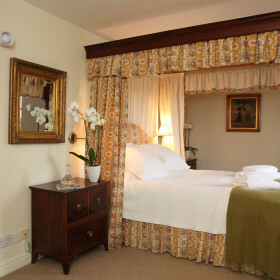 The bedrooms range from opulent four poster double rooms, to twin rooms with replica 18th century beds. 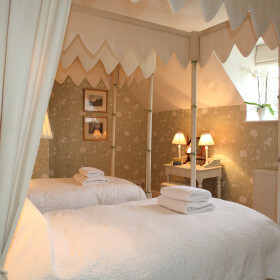 The pièce de résistance is the Princess Bedroom, a white four-poster twin room which your kids are guaranteed to fall in love with. 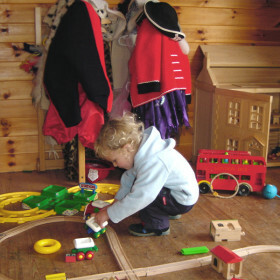 Newmarket House is a children’s paradise with a two-storey playhouse in the outdoor play area, a climbing frame, croquet, football nets and a big indoor playroom with toys and dressing up box. 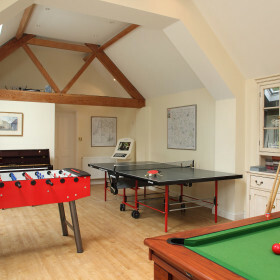 Not to mention the indoor pool and games room. For babies and toddlers cots are available, as well as baby monitors. We want parents to have a good time as well as the youngsters. That’s why we’ve lined up some local babysitters and have prepared a parents’ ‘peace of mind’ kit for all those essentials – alarms, socket covers, door wedges, bed guards, cupboard safety locks, plastic crockery and so on. See Oxford’s dreaming spires and Sudeley’s dreamy gardens. 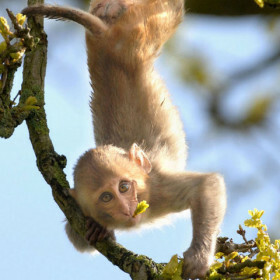 Wear out the kids at the wildlife and safari parks, fly off to Birdland, see life in miniature at the model village and Bourton Railway. Or just wander the winding lanes on a magical wisteria tour.